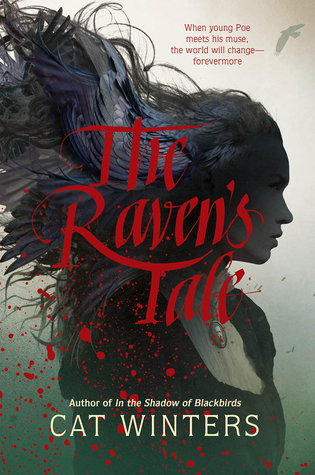 The Raven's Tale is a work of historical fiction, which should be clear from the outset: muses don't generally take physical form and walk around cities leaving behind ashy footsteps. Cat Winters states from the outset that some liberties are taken with this exploration of Edgar Poe's teenage years, and that is one. The emotional connection that Edgar has for his mother (foster and biological), his biological sister, his love for Elmira, his need to be known for his own intelligence and abilities, and his need to write feel very realistic. He feels isolated from those in the higher social class of Richmond, Virginia because his birth family had been theater actors, even though he had been raised in wealth and given the impressive formal education that they did. That college education that Edgar yearned for is stymied from the start by his foster father, who refuses to provide all of the tuition or fees needed, starting Edgar on the path of loans and gambling to try to make ends meet. I didn't know much about Edgar Poe's early life or background, so I enjoyed getting a glimpse into the time period and what his life could have been like. The people around him are also realistic portraits of who they could have been, which tells me that Cat Winters did extensive research not only into the details of Poe's life but into the time period and the major figures of his life. In fact, we do get a closing chapter that tells us more about what happens to them all when they're adults, long after this story closes. The main focus of this story is the battle between Art and Logic, as symbolized by the muses that Edgar interacts with and the fears of his foster father cutting off all financial support. It's a very real fear because the story of the starving artist can have disastrous consequences if they do occur. While fragments of poetry will feed the muse, they won't feed Edgar. As a teenager, Edgar faces the longing to be accepted and make friends and is stricken when those friendships prove to be far more shallow than he had supposed. The poetry scattered throughout the text is actually derived from the first published work that he made, as well as some of Cat Winters' own attempts to mimic it. It really weaves together events in a way that it feels like the natural inspiration for some of his early work. I really appreciate the time and research put in, and how real that everyone felt throughout the novel.